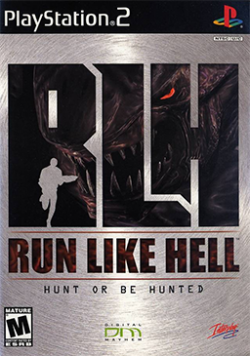 Game description: In Run Like Hell, you can either run or combat the danger lurking around every dark corner. There are some things worse than death in this sci-fi adventure, especially with intelligent alien foes that learn from your actions. Through seven intense chapters, you'll explore various environments, characters, and objects--all enhanced with dynamic camera perspectives. Run Like Hell also features voice acting from Hollywood actors Lance Henriksen, Kate Mulgrew, Clancy Brown, and more, creating a truly cinematic experience. Mining surveyor and former war hero Nicholas Conner, returns to his space station known as the Forsetti Station to find it overrun by a hostile, previously unknown alien species known simply as The Race. Most of the crew members are dead, Nick's fiancee is trapped on the far side of the base, and he soon discovers that the entire station is slowly degenerating into an alien hive. Using his war experience and a large arsenal of weapons, Nick must fight through a group of hostile enemies to locate survivors on the station who can help him find Samantha.